Perched on the northern tip of Africa, just a stone’s throw from Spain, Morocco is one of those places that really turns on your wanderlust juices. 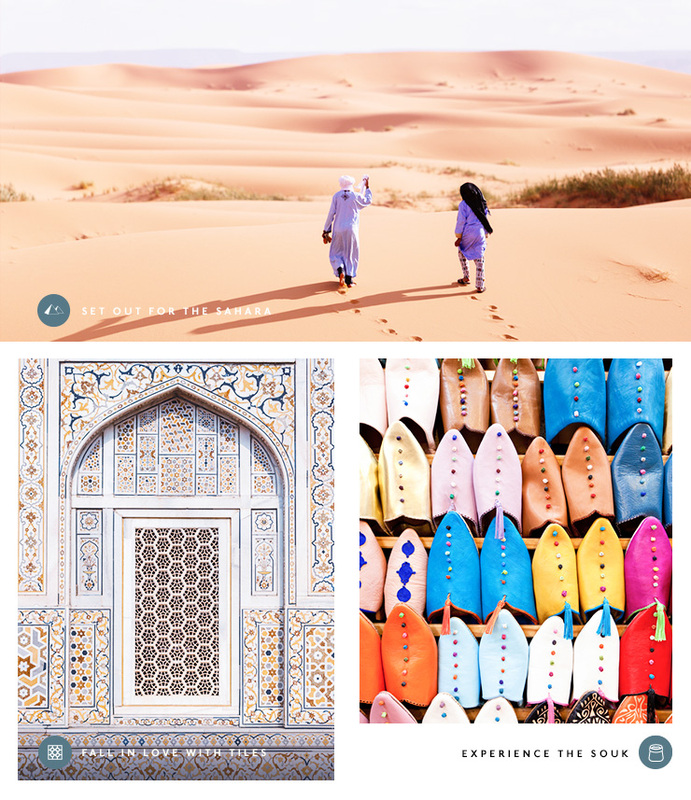 From the delicious food (mmm tagine) and the colourful, creative architecture to the Sahara dessert and the luxe hotels, it’s a wonder we don’t all just up and move there immediately. To help you get there fast, we’ve partnered with the American Express Explorer Credit Card. Perfect for avid travellers, with the Explorer Credit Card new members can take advantage of 100,000 bonus Membership Rewards points when they apply online and spend $1,500 in the first three months of the card approval date, as well as a $400 travel credit and two Sydney International Airport lounge entries per year. Now that’s how you travel in style! 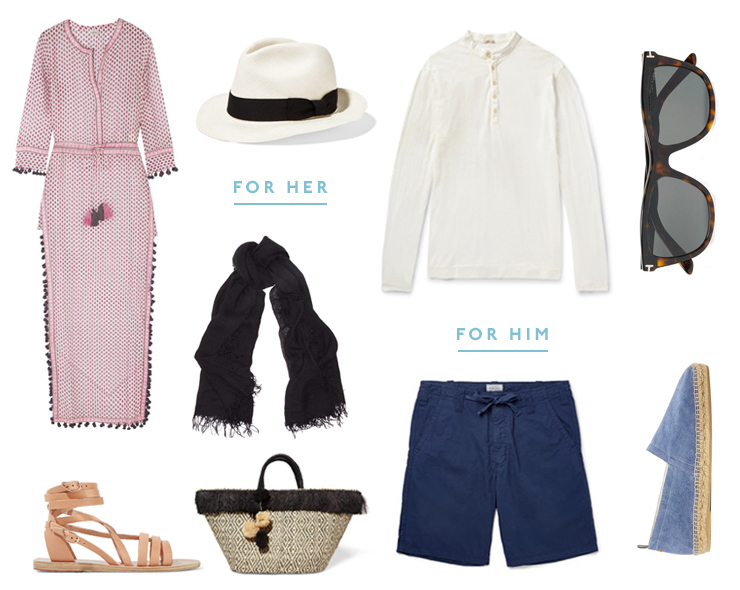 Without further ado, here’s the first-timer’s guide to Morocco. Time to get booking! If anyone is on top of the food game, it’s got to be the Moroccans. From the hearty tagines and couscous dishes to pastille (pie), freshly baked breads and pastries, you certainly won’t go hungry here. El Fenn, Nomad, Palais Namaskar and the street food found at the souks are all a must on any visit to Morocco. When in Morocco it would be sacrilege not spend a bit of time in one of the many luxe hotels and resorts. Even if you can’t afford the nightly rate, a lot of the hotels offer day passes, allowing you to enjoy the pools, spas and restaurants at a lower fee. 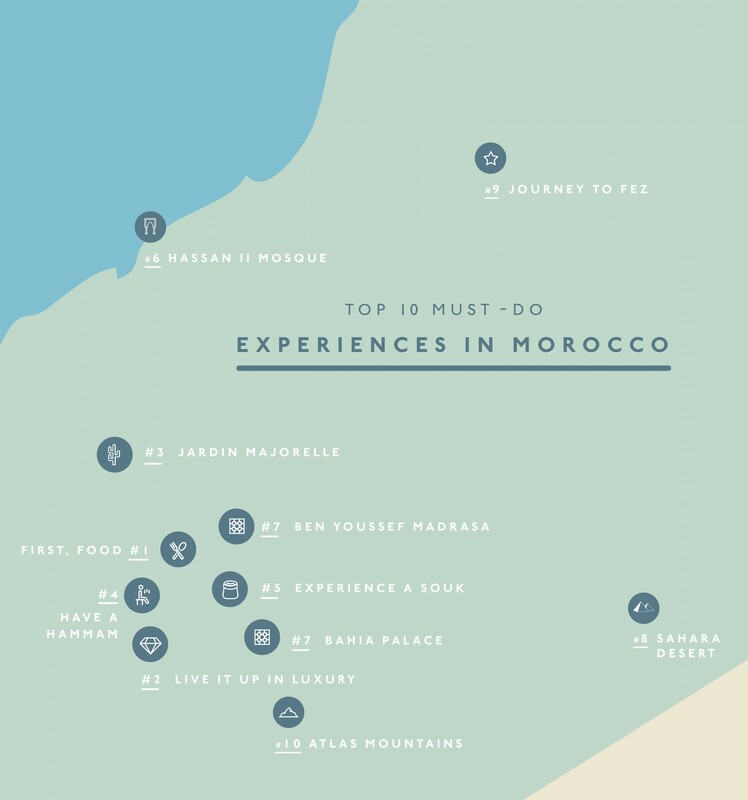 Check out La Sultana, Mandarin Oriental and La Mamounia. Also known as Yves Saint Laurent’s Gardens, the Jardin Marjorelle is a plant lover's paradise. Spanning over two acres, the gardens are home to cacti, exotic trees and plants, streams and fountains set against stunning blue buildings with bright yellow accents. 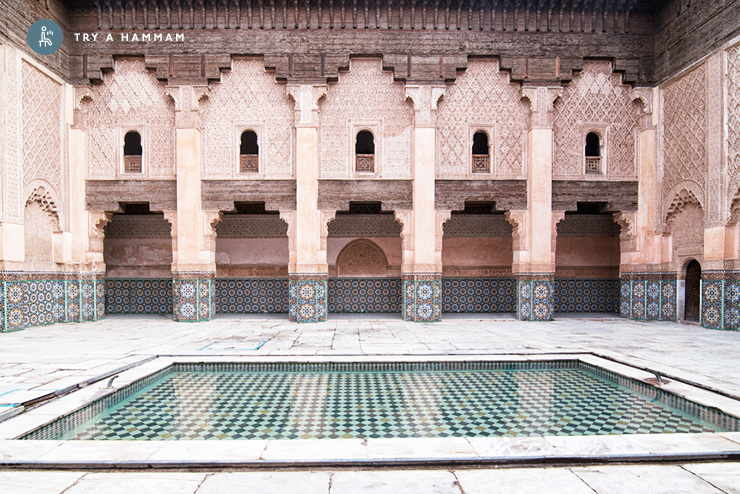 Also known as a Turkish bath, a Hammam is a must-do for anyone travelling to Morocco. The experience usually includes a rigorous scrub, bathing and steaming in a bath and sometimes a massage and plunge in an ice cold pool. There are plenty of public hammams to check out, but for a more luxe experience head to the spas at The Royal Mansour or La Mamounia (or both). Bring on the relaxation! If you’re in the market for some new carpet, shoes, spices, lights or even live animals, the souks of Morocco are the place to go. No matter the time of day you visit, they’re always bustling and full of energy. If you’re in Marrakech check out Djemma el-Fna. This sacred site in Casablanca is the largest mosque in Morocco standing at 210 metres tall and can squeeze in over 105,000 worshippers. An architectural work of art, the Hassan II is filled with stunning mosaics, beautiful glass chandeliers and huge marble columns. Remember to dress appropriately here and throughout your Moroccan journey (that means long skirts and dresses and clothing that covers your shoulders). Morocco has got to be the tile capitol of the world, they’re just about everywhere. Some of the best places to unleash your inner tile aficionado are Bahia Palace and Ben Youssef Madrasa. From the walls to the floor and ceiling, these spots are covered in them! Be sure to set aside enough time to visit the incredibly beautiful Sahara Desert. There is plenty to see and do in this neck of the woods, from riding camels and camping to hot air ballooning and quad biking. Make a beeline for the town of Merzouga and set up camp at the Kasbah Hotel Tombouctou before setting out on a Saharan adventure. The best time to go is between October and February when it’s not too hot and the sand storms are few and far between. The cultural capital of Morocco, a stopover in Fez is an absolute must. Home to all of the Moroccan architecture you dream about, with stunning mosaics, intricate arches and loads of colour, Fez is home to incredible museums and historical sights. Stop by theological college Madrasa Bou Inania and the Royal Palace to get your architecture fix and the Marinid Tombs and Palais Glaoui for a slice of history. The biggest mountain range in Africa, the Atlas Mountains are the perfect playground for adventurers. Aztat Treks offer loads of tours from day trips to week-long expeditions, as well as tours of the Sahara. While you’re nearby, be sure to stop by the walled city of Taroudant. There’s no shortage of incredible places to stay in Morocco and American Express make booking easy—click here to see how! For views of the Atlas Mountains, impeccable service and all of the modern luxuries, look no further than the Four Seasons. The rooms are modern and comfortable with a hint of Moroccan flair. Smack bang in the middle of the city centre, the Movenpick is a 5-star hotel with a whole lot of Moroccan influence. When in Fez a night in a riad is a must and one of the best is the Algila. The rooms are decked out in true Moroccan style. The rooms at the Imperial Casablanca are spacious and modern. The perfect resting place after your busy days of adventure. Being the most isolated country in the world, it’s not easy to get anywhere from Australia and Morocco is no exception. The quickest way there is to fly via Doha or Abu Dhabi and on through to Casablanca where you can hop on the regional flight of your choosing. Morocco is pretty large, so the weather can vary depending on where you are. The best time to visit Morocco is during spring (around April and May) when the weather is pleasant and not too hot or cold. The currency here is the Moroccan dirham. #1. Moroccan’s consider eating with your left hand impolite. #2. At its nearest point, Morocco is only 13 kilometres from Europe. Remember to pack some conservative clothing, you wouldn’t want to disrespect anyone by showing off too much leg.